Mix it up with fun colors. Pick a shade that’s different from the wall, but make sure it’s complementary so it fits with the overall design of the space. Use it as a custom headboard or as a design element on the living room wall. Double layer your crown molding to add drama and depth to the room. Frame your windows with crown molding around the pane or as part of the sill. You can even add it to an arch around a window seat. When it comes to design elements like crown molding, the sky is the limit! 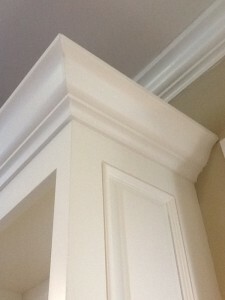 Want even more ideas to use crown molding in your home? Contact us for a complimentary in-home consultation or browse our portfolio for inspiration!